The Alps are the largest mountain system in Europe. They cover parts of southeastern France and northern Italy, most of Switzerland, part of southern Germany, and some of Austria and Yugoslavia. Most travelers consider the towering Alpine peaks, covered with ice and snow, the most magnificent natural sight in Europe. This chain of mountains swings in a broad arc from near the Mediterranean Sea in France northward to form the border between France and Italy. They continue eastward through northern Italy, Switzerland, Germany and Austria. Then they turn southward into Yugoslavia. They form a great barrier which separates northern Italy's Po Valley from the lowlands of France and Germany and eastern Europe's Danubian Plain. 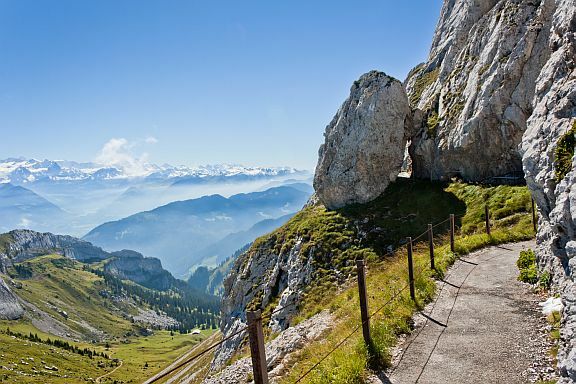 The Alps are about 680 miles long, and range in width between 80 and 140 miles. They cover about 80,000 square miles, more than the combined areas of the states of Ohio and Pennsylvania. Most Alpine peaks range in height between 6,000 and 8,000 feet (1,829 - 2,438 m.) above sea level, but hundreds of peaks tower more than 10,000 feet (3,048 m.). Mont Blanc, in the Pennine Alps, is the highest mountain in all the Alps. It towers 15,782 feet (4,810 m.) higher than the sea. The second and third highest peaks, also in the Pennines, are Monte Rosa (15,203 feet; 4,634 m.) and the Matterhorn (14,692 feet; 4,478 m.). 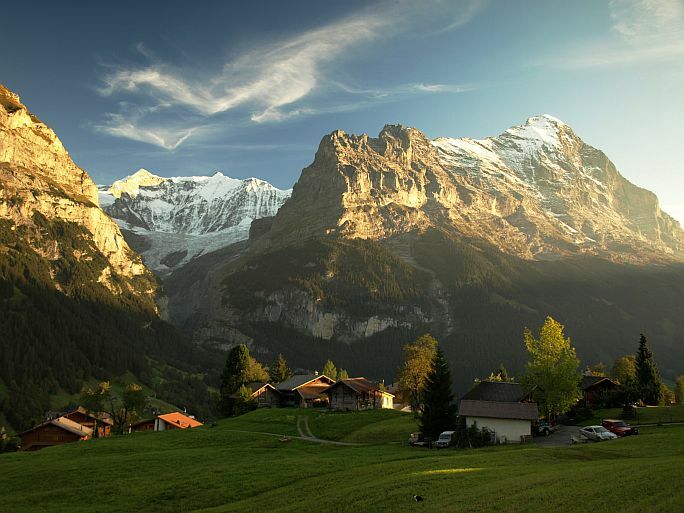 Other well-known mountains include the Finsteraarhorn (14,022 feet; 4,274 m.) , the Jungfrau (13,642 feet; 4,158 m.),and the Eiger (13,025 feet; 3,970 m.) in the Bernese Alps, and Grand Paradis (13,323 feet; 4,061 m.) in the Graian Alps. The Alps are considered the birthplace of "alpinism" or mountaineering. Summer visitors enjoy mountain climbing, swimming, boating and hiking. In winter, Alpine resorts offer skiing, skating, tobogganing and curling. There are many famous Alpine resorts here, including Chamonix (France); Zermatt, Saint Moritz, and Davos (Switzerland); Sankt Anton and Innsbruck (Austria); Garmisch-Partenkirchen (in Germany), and others. Before the birth of Christ, Roman legions crossed the mountains to conquer Rhaeta (Switzerland) and Gaul (France). Later conquerors also crossed over to invade Italy. The first conqueror was Hannibal and his Cathaginians. A few centuries later, the Goths stormed through the mountain passes. Then came the armies of Charlemagne and Charles V. In the early 1800s, Napoleon built a magnificent road through the Simplon Pass for his invading armies.